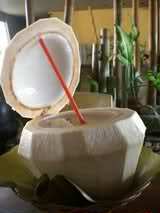 Taken daily, coconut water is an economical thirst quencher, hunger satisfier, and medical cure for renal disorders. This was revealed in an article entitled ” Stay healthy: Drink coconut water daily”. The article was written by Perfecto D. Milla Jr. and Norberto M. Boceta of the Philippine Coconut Authority (PCA). Making this information available to the people will help increase the domestic consumption of coconuts and lessen our dependence on imported drinks. This is also one way of promoting coconut water as an economical health drink. Through the years the consumption in both urban and rural areas have increased dramatically. This is caused by the subliminal effects of softdrink advertisements, the bandwagon effect of the softdrink buyers and the softdrinks’ accessibility to consumers compared to healthier beverages. These factors have unerringly made softdrinks an inseparable part of the Filipino consumers’ daily diet. Consequently, high demand for softdrinks cost the taxpaying public no less than $300 million a year on importations of inputs for the production of softdrinks, fruit juices and concentrates, and advertising and promotions. To minimize this wasteful use of precious foreign exchange, the former Philippine Coconut Authority chairman Wencelito T. Andanar urged everybody to drink and serve coconut water. Another reason is that it is also found to be the best indigenous cure for renal disorders. This medical breakthrough, called “bukolysis“, is the brainchild of Dr. Eufemio Macalalag Jr., a urologist. In his researches, Dr. Macalalag has proven the effectivity of administering coconut water in treating renal disorders and in reducing or dissolving all kinds of kidney stones. The process involved the endoscopic procedure of multiple urethral stenting (MUS) or tubatuin (MUS-T), inserting two to twelve urethral catheters into the kidney ureter and irrigating it with coconut water from seven to nine -month old coconuts or buko nector concentrate powder (BNCP) for a period of 3-19 days. Daily “bukolysis” and renoclysis with BNCP efffects approximately 10 percent reduction in the size of all types of stones treated. Dr. Macalalag said the water from one mature coconut consumed daily, which is equivalent to about two full glasses per nut, could almost guarantee that the formation of stones in the urinary tract would be prevented. Dr. Macalalag asserted that the biggest plus factor in “bukolysis” is its capacity to dissolve kidney stones and arrest their growth. As such, it is an economical alternative to the usual expensive remedies. Coconut water was always good for health & will live for ever.Doctor always suggest patient to have a coconut water.Thanks for sharing such an interesting information with us.Great!